I recently bought a 6 string semi-acoustic-electric Washburn at an auction in, Kyrenia, North Cyprus. It is in almost unmarked condition and has a label inside merely saying 'George Washburn'. The serial number 349 is stamped next to the stress rod. The electric pick-up is Washburn 'Equis II' (made in England). This appears to be a very high quality guitar, which, on looks and sound, alone, is the reason I bought it. 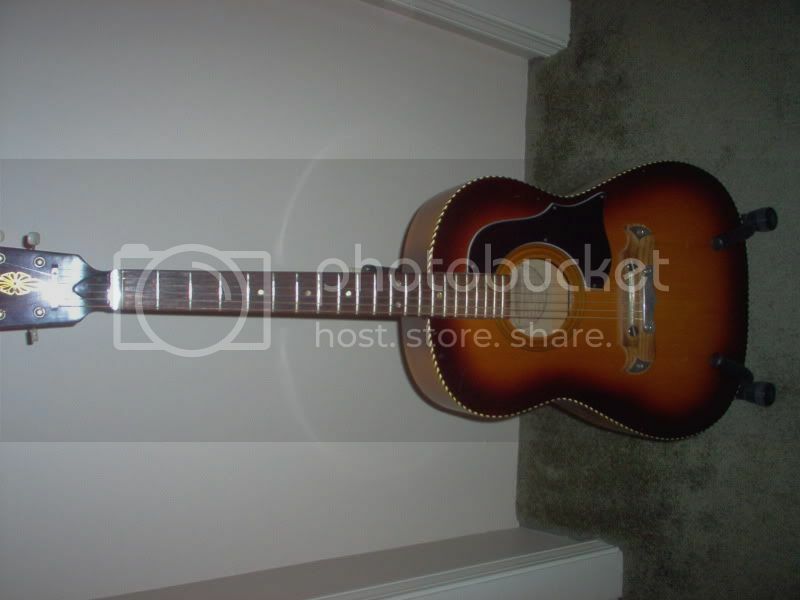 I have photos of this guitar on 'desktop', but can't work out how to post these images with this message - can anyone advise, please? Re: A rare Washburn model? Welcome to the forum. In order to post pictures you need to use a photo hosting site. Photobucket.com is free and easy to use. If you do post the pics that would be a big help in ID'ing your Washburn. Sorry folks - I'm making a real 'pig's ear' of this photo posting biz! 'Photobucket' won't let me join - I made so many attempts, I just gave up in the finish. My last attempt to post pics. [from imgbin website] of my Washburn yielded 2 of the same pictures - even though the numbers and pictures I uploaded were different. The first one should have shown a photo of the front of the guitar. THANKS 'ship of fools' - I was just about to post the photo when you replied! Wow - that photo posting attempt worked! You have to be a bit patient when you 'click' on the link; as, firstly. a large image is portrayed - then this [mysteriously!] snaps into a smaller picture. Thanks SO much for your thoughtful and swift response, SoS - you've just made my day! 1./ Takamine - apparently it's the 'Lawsuit' model - supposedly a Martin copy. It nearly never goes out of tune - even here in the Middle East! My friend has a Martin D41 [lucky so & so! ], which loses it's tuning after very little time, but the Tak. doesn't have quite that lingering Martin depth and resonance. 2./ Framus 12 string 'Texan' - made in Bavaria, it has 32 laminations of wood in the neck and a nicely bowed back. Disappointingly, it doesn't hold its tuning for long - not even a week at a fairly even temperature. It does 'ring out' quite nicely, but is a bit of a 'finger-tip shredder'! I love those old Framus's had one for some time and it was a great player. SoS - Your's looks a better quality than mine. The body edging on yours is much nicer. I'll post a photo of my Framus later, tomorrow, but have to dash off just now! Nice looking Washburn. Here is a bit more skinny on the EA40. This is the pic. of my Framus 'Texan' - mine looks pretty 'bog-standard' compared to yours, SoS! Hey Pike glad to see you stick your head out of the shop, you've got to get out more often. Yep she wasn't the prettiest but it could play and the funniest thing about her was she had a slight twist in the neck right to left that made the neck line just perfect. Now my main players are my Kronbauer and my D2003S and of course I still travel with my Rover all over the place, was down your way just a few weeks ago doing some shopping and to see another guitar, didn't work out for me was far to rough shape for me to buy and it was something I was looking to flip but there wasn't any money left in it. Re. my 1991 Washburn EA40 'Woodstock' ['Birdseye' maple]. Recently, I noticed that the fret wires under the high 'E', 'B' & 'G' strings, for the first three frets down, are slightly indented and I think they are causing slight 'buzzing', although I might be wrong about this being the cause of the buzzing. Should I replace the first three fret wires and, if so, does anybody know the correct size of replacement fret wire for this model guitar? There doesn't appear to be any wear on any of the frets further down the fret board. Sound advice would be much appreciated, other than telling me to take the guitar to a luthier, as there are none in North Cyprus, where I live. It would not be economically viable to ship the guitar overseas for repair. I've done quite a bit of research on the various forums about re-fretting and, as I have all the necessary tools, I'm prepared to risk giving the job a try.